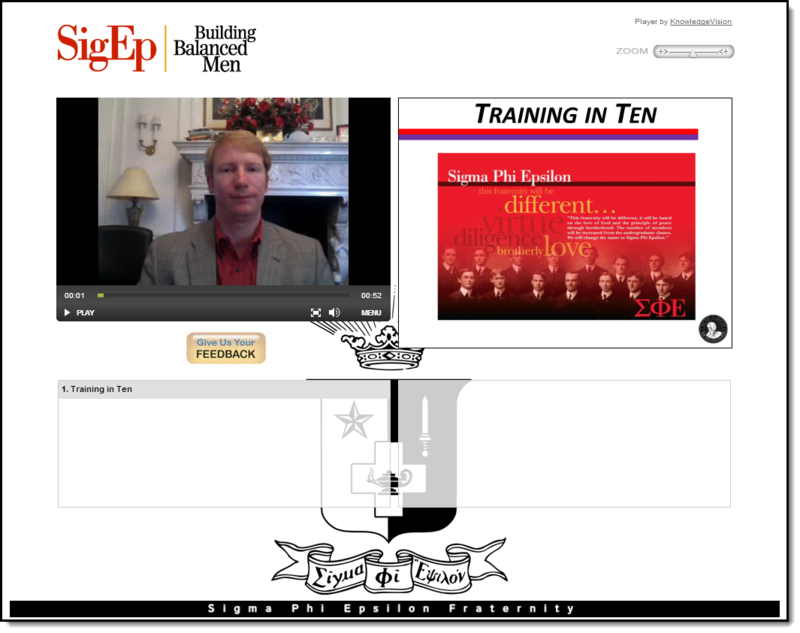 Starting today, SigEp Headquarters is unveiling a new way to bring effective training to our many volunteers. You may have seen teasers about following @TrainingInTen on Twitter and wondered what is was about. Well, it is time for the big reveal. Be sure to go to the linked site to see the entire 10-minute introduction. 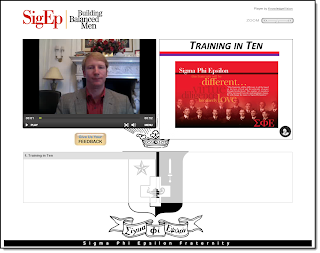 "Training in Ten" is the HQ brand for a continuing series of twice-monthly 10 minute webinars specifically aimed at all the volunteers who give back so generously to SigEp with their time, expertise, and guidance. The first edition is an introduction to the series and covers the What/Why/How of this new communication channel. The screen capture shows there will be a narrator and slides to present information both with audio and graphically. Future webinars will address core topics that AVCs face regularly: Mentoring Undergraduates; Cultivating Alumni; Managing Assets; Managing Corporate Health; plus topics on Personal & Professional Growth. There are also opportunities to suggest topics, provide feedback, and let others know what your AVC and chapter are doing well. "Training in Ten" is available several ways. If you use Twitter follow @TrainingInTen or (and!) @OfficialSigEp. You can also "like" the Official SigEp Facebook page or check with the "Official SigEp Blog" on the headquarters site. S&P will be investigating methods to include a link here as well. Thanks to HQ, and especially to Archie Messersmith for developing a new way to add value and interest to our volunteers.